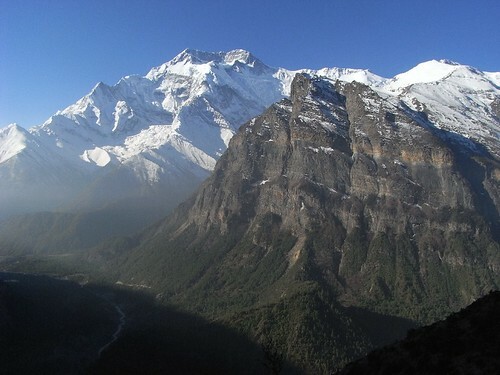 The Annapurna mountains is part of the Himalaya and consists of various peaks over 7000m. 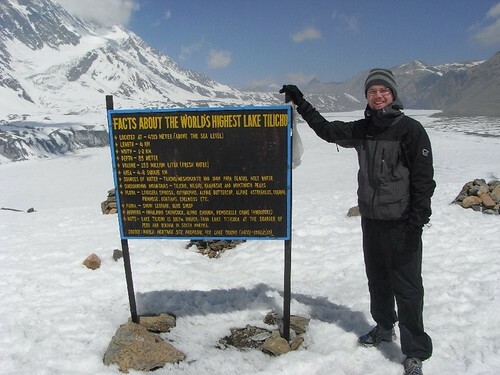 It includes two of the highest mountains in the world; Dhaulagiri, being the 7th highest in the world, at 8167 m and Annapurna I at 8091 m. You can see an overview map here. The trek normally takes 16-18 days. I spent 19 days due to two days of resting, two days being sick and two days taking a side-trip to Tilicho Tal, the highest lake in the world. It was the best trip I have ever done. Fantastic landscape, impressive mountains, welcoming people and lovely villages. Took the bus early in the morning from Pokhara after saying goodbye to a sleepy Line. Bumpy road and narrow seats made it very uncomfortable. The bus arrived in Beshishar at 11am and I decided to take a jeep further to Bhulebhule. It was cheating not to be walking but I wanted to get up at high altitude as soon as possible. Something I do regret in retrospect because the first and last part of the trek was the most enjoyable except for Tilicho Tal. Met Jamie, a Welsh lad, on the bus and we started the trek together. 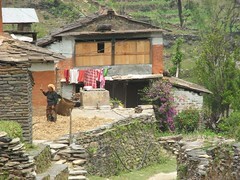 Started off below 1000m so it was quite warm as we walked through small villages with lodges and tea-houses. It seemed with the services offered it would be an easy trek. Reached Bahundanda at the top of a hill and checked out the available accommodation. We considered the Hotel Mountain View at the very top and with as the name suggests a view. We ended up at the smallest lodge and it was well worth the change. A small family house with three rooms. First they said 100 rupees but after we said we considered one of their competitors they soon dropped their price to free. 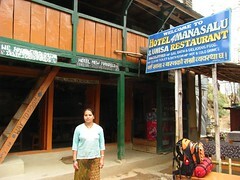 Most lodges have cheap prices for the room but serve relatively expensive food. 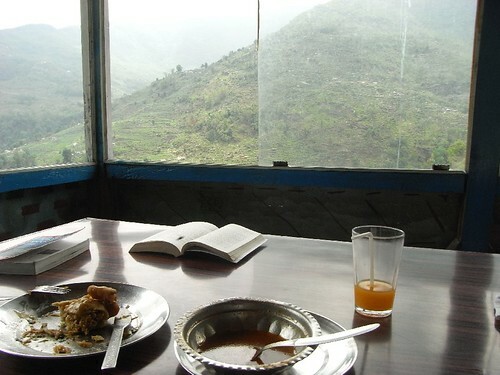 For dinner we had Daal Bhat which is the staple Nepali fare and consists of rice, potato-curry and lenses soup. Walking all day takes a lot of energy and last night I was in bed before 9pm. Woke up at 6.30am and had a good size portion of oat porridge served by the very nice lady at the lodge. A perfect start before taking a slow walk towards Syanje across the river a bit further up the valley. It is here the road ends and some people take the jeep all the way up here. A bit more going upwards at this point of the trek and I really started to regret having a huge backpack with lots of clothes. Hopefully it will be worth it at the top where it could be quite cold. Not many tourists around. Maybe because it is the close to the end of the season with the monsoon just around the corner. We ended up meeting all the same people along the path and in Chamje the hotel we found got quite full after a couple of hours. In addition to me and Jamie there were two dutch ladies and their guide & porter, two Australian girls who lived in the glorious city of Brisbane and a nice young American couple. Scored a free room here as well. All the other guests have gone to bed and I'm still up chatting to the guide and porter. I slept an hour after my nice hot shower. Not all hotels have warm water but this place has solar power to heat up the water. Other places it is possible to get a bucket with water heated by firewood but the night before I had a cold shower because I don't want to use up the firewood to these poor people. 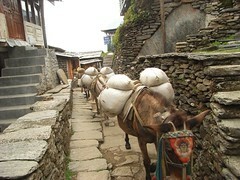 In addition I purify the water with Iodine tables instead of buying bottled water which has to be carried up by porters. The food I buy is rice or potatoes with vegetables, so it is all locally grown. Going up from Chamje to Tal the landscapes changes from a narrow green valley with compact little stoned pawed villages to a wide sandy valley. Ended up in Danaque and went to bed early as a had a slight headache and could still feel the cold that had me staying 12 days in Kathmandu. Woke up late at 8am as I had no alarm clock. Wanted to take it easy today to recover my strength. 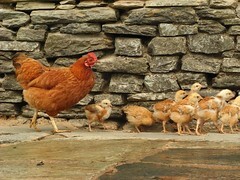 Everyone had left the hotel when I woke up. Did an easy walk as I promised myself and a little up the hill I met Tom & Duncan who had planned an easy day as well so we ended up going in the same pace together. This area is not only different in the landscape but also the people are different. 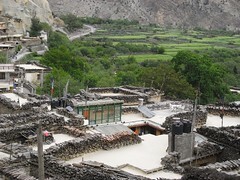 This is a Buddhist area and many Tibetan people live here. 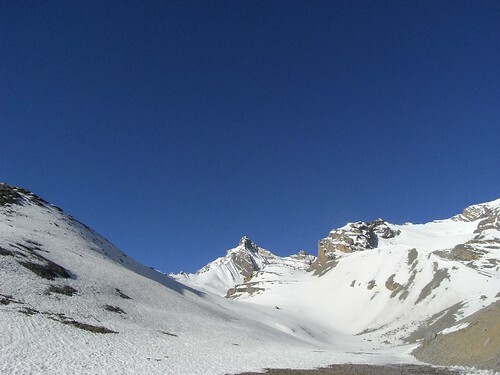 In fact many parts of the Annapurna and especially the Mustang area north of it is considered to be more Tibetan than Tibet itself due to the Chinese influence there. 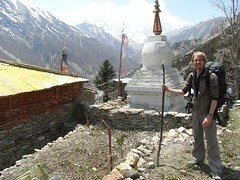 As we arrived in Chame I again met most of the other people I previously encountered on the trek. It was a rather large village and so I continued to the next village was very small. I prefer to stay in small lodges in small villages. Being in the mountain is all about peace and quiet so I tend to avoid the big popular lodges. 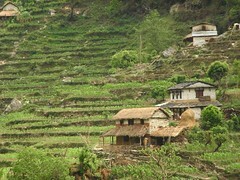 Also as Nepal is one of the poorest countries in the world I think staying in small family lodges with people who cannot afford to build a big lodge is a great way of helping these people. Tom and Duncan got up their pace and went further to the next village. A small family of four women lived in the small lodge I stayed in. I was the only guest and I was invited into the kitchen for my Daal Bhat while they were eating momo's - sort of like a Chinese dumpling. On of the young girls were at the stove while the mom was making the momo dough. I'm glad the firewood based stove had a chimney for the smoke to get out as many poor Nepalis just let the smoke free in the kitchen as with a campfire. Thus a common problem is all the smoke they breathe. The food ended up being very good and I also sampled a momo which was great along with an extremely spicy homemade chilly sauce. We chatted about prices in Norway and if the girl were married or not. Both of the girls, 19 and 27, had boyfriends. One who lived in Kathmandu and the other in the next village. But they both thought they were too young to get married. My pace was a lot better today and nobody passed me. 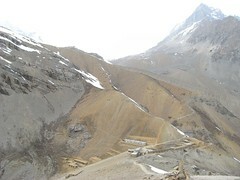 Went as far as Pisang for lunch and had decided to start on the upper route to Manang after the food. Which I would soon regret when an hour later would be situated at the bottom of a very steep climb up to Ghyaru. 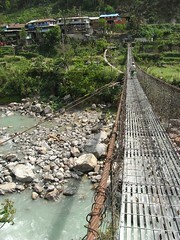 Going to Manang there are two options. 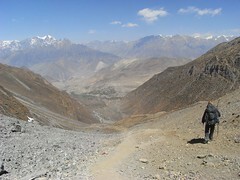 Most people take the easy lower route down in the valley but the upper route consist of two old Tibetan villages and some of the best views on the trek. So it was an easy choice but I can assure you it was not an easy walk up there. Probably three hundred meters going up very steep to Ghyaru which I could see on the top of the hill. Went very slowly and had plenty of short breaks. It took me an hour up there and it was definitively worth it. 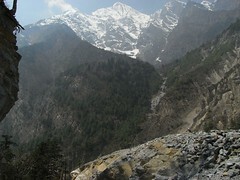 Great views to Annapurna II, 7937m, and Annapurna III, 7555m. And the next morning would be ever better with crisp clear morning views. 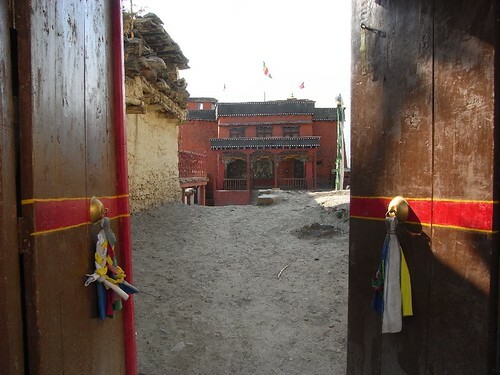 Ghyaru is an old village from the middle ages and all the inhabitants originate from Tibet. The tree line is below the village so it gets more wind in addition to the colder temperature as it lays at 3670m. On the way up I considered bringing out my gore-tex but thought it was too soon on my trek to take such a step. Only two lodges in the village and Yak Ru Mount View is the largest and a very typical mountain lodge with a fireplace in the middle of the lodge. 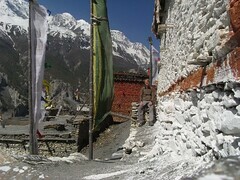 The building is the first lodge I encountered on my trek which is made of bricks instead of wood. Had a delicious Tibetan bread and some local thick noodles for dinner. 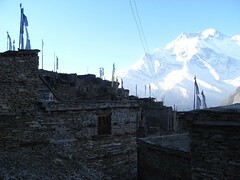 Woke up really early at 5.30am just as the sun was getting it firsts touch of the top of the Annapurna II. Amazing view from my bed. 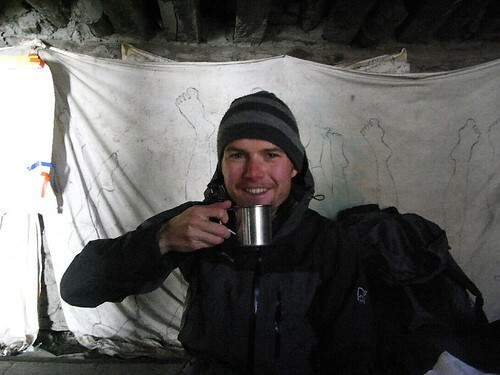 Getting out of my sleeping bag I realize quickly that this place is a lot colder than places earlier on the trek. Had to put on my synthetic long underwear, fleece-sweater and my thick woolen sweater. Continued to enjoy the great view while having oat porridge for breakfast. When I finished I could hear some familiar electronic music and thought it would come from the room of the French couple who were also staying at the lodge. I soon recognize the tune by Gotan Project and surprisingly the music is not from that room but the shred on the side where the owner and his wife sleeps. The door is open and I see a big Jamaican flag with a marijuana plant printed on it. Had a chat to him and he said he was a bit lazy today as he had too much too drink the night before. Filled my water bottle and went to the next village and forgot to refill my bottle there. Stupid of me as the walk to Manang, the largest village on this side of the trek, was a bit longer than planned. So I was very thirsty when I arrived at 1pm in Manang surviving with 1 liter of water since 8am. 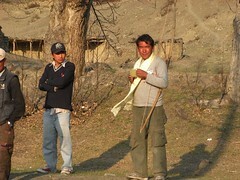 As I got into the village some crazy runners started to appear and it was a marathon in the Himalaya! Definitely a big village - they even have three cinemas! The one we chose had a TV and seats with yak fur. 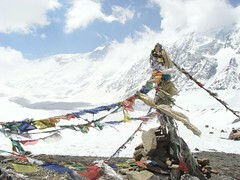 Saw 'seven years in Tibet' and while the movie wasn't all that the yak fur seat experience at 3500m was great. Halfway through the movie the power went out and the owner had to get out and start his generator so we could see the rest. 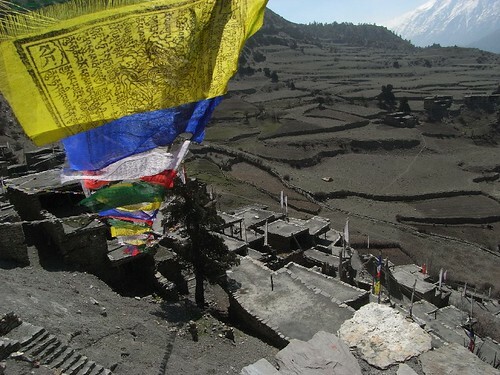 Planned to stay two nights in Manang at 3500m. To avoid altitude sickness it is recommend to spend two nights at this altitude before ascending slowly. My one day of rest turned into four as my I started to vomit the second night. The toilet was outside my room and I woke up at 2am and felt I needed to take a visit to the toilet. I did and went back to sleep. Two hours later I woke up feeling nauseous and thought it would be wise to get to the toilet. Got up and felt that I should get there really quickly. Ran through the door and got there just in time to feel my dinner coming up. Felt bad the next morning but had enough energy to get out and find some oat porridge. Met Jamie outside my hotel on the way back and he asked how I was. I mumbled 'not so good' while walking quickly with my eyes fixed to the ground towards the toilet. 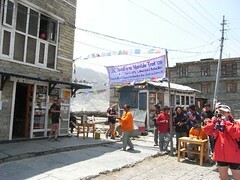 Went to see the doctor at the Himalayan Rescue Service. Was told just to drink lots of water and wait before I took Antibiotics if it got worse. 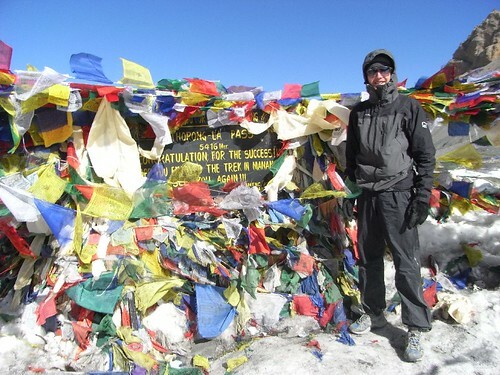 As I was pretty sure of before I went there they assured me that it was just normal diarrhea and not altitude sickness. Spent the rest of the day in bed and finished listening to 1984 from my iPod. The last day here I was not sick but used it for recovery. Wanted to see another movie but the cinema owner did not want to put it on just for me - too expensive for him. So I started walking down the street and I see someone who look familiar. And I can see the guy looked and me and thought the same. It was Pierre a French guy I met on the ferry from Bandar-e Abbas in Iran to Dubai. 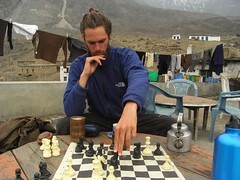 I knew he was in Nepal but it was nevertheless a big surprise to see him in Himalayas at 3500m! 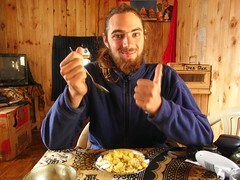 I talked to him about my plan the next day about going to Tilicho Tal, the highest lake in the world, and he seemed interested but he was trekking with a French couple and the guy was sick. Walked slowly towards Khangasar and noticed someone who walked 300 m behind me. After a while I stopped for some water and notice it was Pierre who had changed his mind and was coming to Tilico Tal as well! Since I been sick I planned just to stop in a lodge halfway but we ended up going all the way to the base camp lodge together. 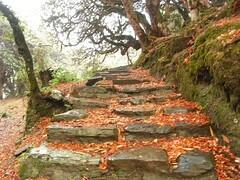 We were a bit unsure at first since I heard the path to Tilicho Tal was dangerous. It was also written on the signpost in Khangasar. But that was not enough to stop as and we started walking. After five hours we approached a landslide area which from a distance looked very dangerous indeed. A steep path went along halfway up the hill and it was all sand and small rocks. When we came closer it was not that bad, in fact it was quite easy. Only had to run a few places where the path was very loose and the rocks created small landslides as we walked. 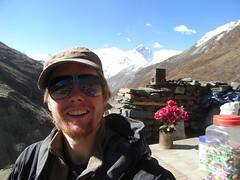 Stayed the night at Tilico Tal Base Camp Hotel. No electricity or hot water. Woke up around 6am to see the first clouds so far on the trek. And at the worst time as we were getting up to the lake today. Started walking an hour later from the lodge at 4150m. Within three hours we would reach Tilicho Tal, the highest lake in the world, at 4920 m. Started easy and after about fifteen minutes we saw a deer. 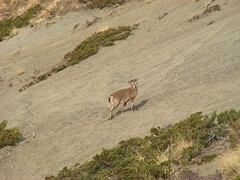 Or what we for two days thought was a deer until someone told us it actually was a blue sheep! Let me tell you that this animal is neither blue or looks like a sheep! It looks like a small deer crossed with a goat. It is snow leopards favorite meal so we were looking out for them but did not see any. This part is the best place for spotting snow leopards. 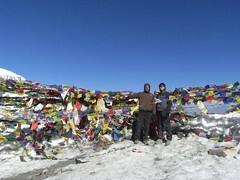 In fact two days earlier two guys saw one just outside the Tilicho Peak Hotel. Lucky guys as it is a very rare sight (BBC spent six months trying to film a snow leopard while making the excellent Planet Earth documentary). Further on this one deer joined a big group of deers, maybe 15-20 altogether. Going up the steep hill to the lake was very tiresome. 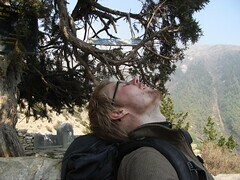 I began to feel the altitude and got minor headaches. Ascending 800m in less than three hours is a lot. When we reached the top of the hill we had to walk through snow for about 30 minutes before we reached the lake. The lake was all frozen and quite large. It was a great sight. A huge frozen lake in an all white landscape and with three enormous peaks - all over 7000m - very near. 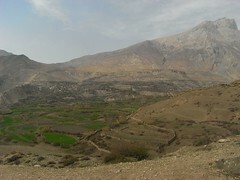 In fact if we walked 3-400 m towards the mountain it would go straight up from there. This is one of the very few places on earth where it is possible to walk without mountaineering gear and be so high up and close to such high mountains. It was very windy up there though. Had my gore-tex on and I was still cold. Mostly due to my own fault forgetting to zip up my fleece which I had underneath. Did not spent a lot of time there. 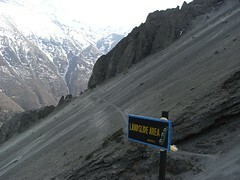 Took a shortcut to Yak Kharka so we did not need to go back to Manang. My eyes are normally very sensitive and today I could really feel the sun or maybe it was the effect of the snow at Tilicho Tal. 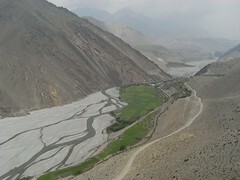 When I got to Yak Kharka I had to stay inside my room to avoid the sun. Had breakfast before six and headed out as soon as possible to avoid most of the sunlight. Reached Thorung-Phedi base camp at 9am and had a long lunch before taking the short hour walk up to the Thorong-La High Camp lodge. A long day walk from high camp over the Thorong-La. 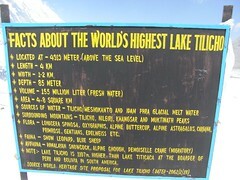 The highest pass in the world at 5400m. It was a bit windy and I thought it was cold but one crazy Canadian guy was wearing shorts. 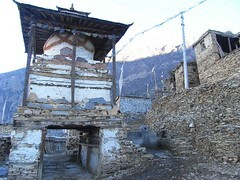 Went pass by Muktinath which I did not like and ended up in Jharkot. A very nice village. The temperature is a bit more comfortable now so I have no more need for my warm clothes. 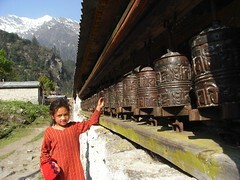 The Jar Choedhe Rigdrol Phuntsog Ling Sakya Monastery in Jharkot also has a medicine hall and school for poor children. I had a quick tour and ended up chatting with the Tibetian doctor. Told him I had some clothes I wanted to donate and they were very grateful to receive it. As a thanks he made me some Tibetian medicine for my cold which I still had after three weeks. 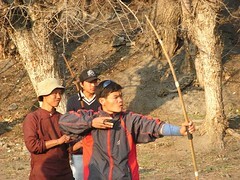 After the visit to the monastery I went to see an archery competition. All the local guys were doing their best to impress the girls and to prove their skills over their mates. The Tibetian doctor also had a go but I would say it would be best for him to stick to his healing herbs. 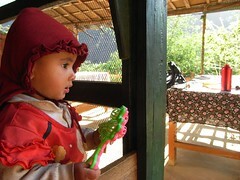 Marpha was an excellent place to stay as they have amazing apple crumble. Or anything with apple I should say: apple pie, apple juice, apple brandy and so on. 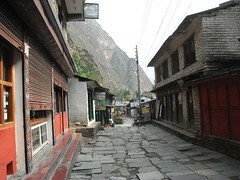 Marpha to Tatopani is usually a two-day walk. I did it in one day and paid for it. I was so tired when I reached Tatopani in the dark at 7pm. Or 'you looked like a wreck' as on British guy told me when I met him again while rafting the next week. My feet were starting to form blisters which I had to attend to by sticking a hole in them with a needle. 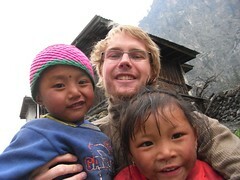 I looked so bad that the hotel gave me a room with all the Nepali porters. Which I did not mind as it was cheap. First rain on the trek. At around noon it started pouring down just when I sat down for lunch.